It was in an old part of the city that had fallen out of fashion that I saw the house. Looming on a bluff above the lake, it stirred in me nostalgia for beauty, a longing for a time when objects and buildings were crafted with respect for the human soul and its need for radiance. I longed to walk its wooden floors, climb its gracefully curving staircase, cross its gallery landing, feel the craftsmanship of its woodwork against my fingertips, and take in its detail, its mystery, and its artistry. I traversed the cracked pathway to the door and gazed through the little window in the arched portico. The glass was frosted with years of accumulated dust and dirt. I peered past the grime and into the front hall, where the stairs ascended from the black-and-white tiled floor. I glimpsed the parlor to the left of the hall and drank in ceiling beams, built-in bookshelves, and a large stone fireplace. I looked up and marveled at the arches and the vaulting. I felt the kind of reverence the pious feel in prayer. The old oaks in front of the house stood in splendor as well. Their barks were finely textured, their branches bent into magnificent curves. Vines grew up the sides and the front of the house, twisting around each other, some choked by others, brown and dry; some burning yellow or red in the autumn sun. There was an old sign buried in the overgrown grass. The ink had faded years before, but I discerned the imprints of the words FOR SALE OR RENT. There was no indication of where to inquire. I strolled down the path away from the house and turned to absorb its beauty once more. The sun was setting behind it, transforming the sky to a deep violet hue. I looked up at the bay windows on the second story. The room that belonged to those windows would make an inspiring writing room. In that room I could watch the sun rise over the lake. I could sit at an old wooden table on an old wooden chair and my pen would scratch across the paper in fluid and relentless motion. I could spend early mornings working on my novel before walking to the STS stop to get the train to the news office. Such productive mornings would make it more pleasurable to report on the news of the day. If I had a haven to come from and to return to, I could bear the lifeless work. I would come home and spend the evenings with candles and a warm fire. I would have my books; I would read all the little volumes I cherished again and again until I felt them heal my soul’s wounds like a balm. It would be drafty and cold in the large house, but with wool blankets, a hat, a scarf, and warm slippers and clothes, it would be worthwhile. It would save me from the depression of the small room I inhabited now, with its solitary window, its overbearing landlady, its smell of old cabbage, and its lack of pets. Yes—I would rent the house, and I would get a cat and a dog. The cat would sit in my lap; the dog would nestle at my feet. The lake breeze stirred the leaves above me. The dark windows gave the house the appearance of being asleep. And of waiting. I felt a strange resonance as I stood before the house. It seemed to call to me as I reluctantly turned the corner and walked away. I picked my way down two deserted blocks, past other old houses, past cracked windows and crumbling brick, past overgrown gardens, past a lonely church, and toward the main street, where I turned right. The road was desolate in the twilight. I passed a vacant sweet shop, an abandoned market, derelict cafés and restaurants. All were empty of life. But as I passed the old pharmacy, I thought I caught a glimpse of movement inside. I turned and peered in the window. It was dark within, and still now, and I could see nothing. I started to turn away in disappointment, but then I knocked on the window in case I was now wrong, in case the shop was in fact occupied as I had first thought. There remained stillness and silence. Then, suddenly, a match sparked in the darkness, the flame lit a candle, and the beacon moved toward me through the gloom. The face of an old man was illuminated in the glow. 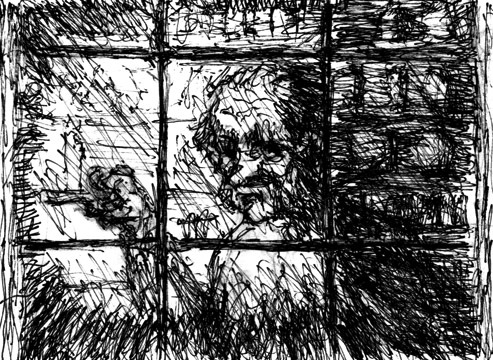 “What do you want?” the man appeared to snarl as he approached the window. I read his lips. I could not hear his voice through the glass. His eyes were wide; his heavy brows were tensed together; he looked wild, surly, and defensive. I knew he wouldn’t hear me. I pointed to the door on the corner, urging him to open it so I could make my inquiry and be heard. The man scowled and shook his head. I pointed behind me, toward the east. My voice sounded louder than I expected it to, and it seemed to echo. It sounded unnatural in the surrounding silence. But the man gave no indication of having heard me. I made a sign of a house with my hands—a triangle with my fingertips touching to indicate a roof. I pointed eastward again. The old man shook his head vehemently, his eyes burning with what seemed like fear. Then, suddenly, with a feral exhalation, he blew out the candle. I could not tell if he turned away. Darkness had now fully enclosed the street. I stumbled blindly in the direction of the STS stop. I had nearly a mile to go, and I wished, simultaneously, to happen upon someone who knew about the house, and to happen upon no soul. The gloom was thick. The night was black, with a heavy dark cloud of murky fog overhead. It was much darker than more fashionable streets on which there were streetlamps, traffic, bustling shops, and the pulse of society and life. The street was more like a forest, with a perilous path that meandered around piles of garbage rather than trees, a path that was dark and indiscernible. Presently I ran into something solid and iron-like—an old stove, I guessed, as I fumbled my way around what was at the height of and what felt like a range. I stepped cautiously toward the other side of the obstruction, and continued on with uncertain steps, my hands in front of me to warn me of further obtrusions. I felt blind, as if with each step I were about to fall from a precipice. Suddenly a rough voice called through the abyss. It came from some distance ahead. I had been beginning to feel uneasy by the darkness and the emptiness, by the ruin and the quiet that was broken only by sporadic and distant skittering sounds. Now I felt chilled by the suddenness of the raspy voice that seemed to come from nowhere.